$10,000 in Tripawds ASAP Grants! 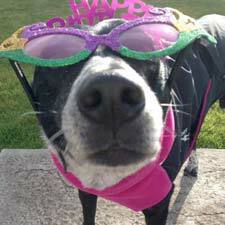 The Tripawds Foundation ASAP grant #20 goes to Tripawds member pt02040608 to help pay for Tuxedo Tom’s amputation surgery. Read on for his story, and learn more about the Tripawds Amputation Surgery Assistance Program to see if you qualify. This grant is made possible by the charitable contributions of Tripawds fans like you. Thank you for your support! On December 16, 2018, found your site after a week of doctoring our loving cat Tuxedo Tom’s right back paw. When we saw that he had chewed off his bandages and his paw no longer had signs of circulation in it; we knew we didn’t want to lose him and that amputation would be hopefully an option. Your site was giving us hope – even when we weren’t sure – for that we say “Thanks to each one of you” for sharing your stories. PLEASE NOTE: Tripawds ASAP grants have been temporarily reduced to once per month due to limited funding. Please help keep this program going! Tuxedo Tom’s story started seven years earlier when he was attacked by a K-9 that had gotten loose. He spent 36 hours in the veterinary E.R. hospital, and upon releasing Tom they said there wasn’t any broken bones. 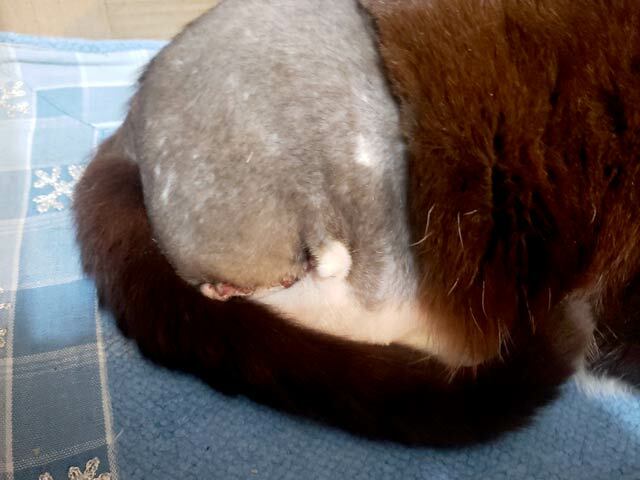 We thought that was a miracle – considering his back right leg and thigh had been ripped wide open and he had over seventy five bite marks. So, for the next seven years the various doctor’s said that his limp was due to the ligament/muscle tear and that he was fine. Unfortunately, his bones had been badly broken at the time of the dog attack. Moving forward – on December 17, 2018, we found a new veterinarian in our small community, and after examining Tom’s injuries, was informed that we did have a choice to save part of Tom’s leg from his vast injuries that never healed right; that his leg was still broken and that the joints had fused together. Not being able to move the right back leg had possibly caused either a blood clot or the lack of circulation to the end of his paw which now needs to be amputated. But his leg was dying, that was why our precious Tom was attacking it. How much needless pain has he endured? 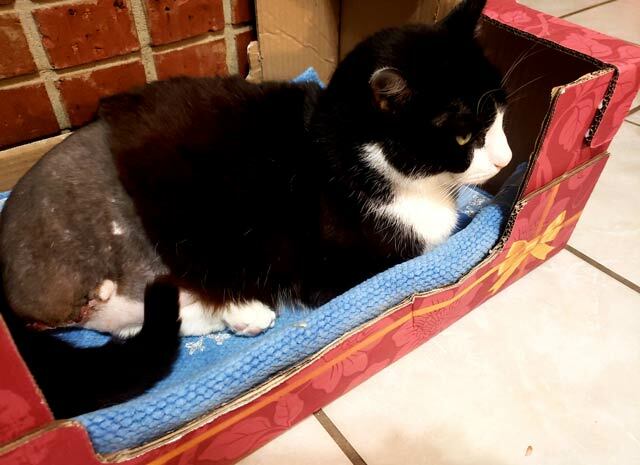 On December 18, 2018, our precious Tuxedo Tom had to have his back right leg amputated. The doctor thought she could save his leg up to the first knee cap but in surgery she found the ‘extent of the damage was greater’ and had to take off more. The surgery for Tom went well, but afterwards they tried to put a cone on him and he wanted nothing to do with that…LOL. They named him “Houdini” – within seconds he would come out of the cone, and no matter how hard they tried he wasn’t going to allow it. So for the next 24/10 days we could not allow Tom to be alone-or he would start licking and picking at the surgery. Of course, the drugs made him loopy and walking was hit and miss so he and I were inseparable for those initial ten days. His stitches were removed on the 27th and of course that was another chance for him to continue on the picking and licking…. It has been loving 24 hours a day of watching over him since the onset of this journey..but the gift of Tom still being here with us is greater…God is faithful. He is still on the mend – one section of his incisions is taking longer to heal. Nevertheless, as Tuxedo Tom is still adjusting – he ‘Houdinied’ out of the house yesterday tried to climb one of our oak trees and of course slid back down…but we can help him master that oak tree again – by making him a set of steps up his favorite tree…not a big deal – after all he is a cat and they love heights. He is healing, adjusting, and so are we – just very grateful we had a choice and our loving little guy is still with us.